This Thursday, Five writers and I converge on The Jewelbox Theater in Seattle for what is sure to be a rock lit spectacle like none other. You're not going to want to miss this. Here's the info. This event is brought to you by The Weeklings, hands down the best arts and culture site on the planet. Speaking of The Weeklings, the folks there were kind enough to publish my rock lit manifesto this past week. Vive le roque! Finally, Jon Grayson interviewed me on KMOX this past week as well. We talked Badge, rock stars, and a certain AZ band. The Week in Badge Interviews! I had some butterflies before my first radio interview to support Badge this past week. It had been (gulp) six years since my last, and--like the consummate professional I am--I didn't prepare, and it was a long interview by radio standards (20 minutes). Still, Jessica Glenn of Type Cast at KZME 107.1 had great questions, and I was pleased with how it came out. We talk at length about Badge, but go into topics like "Calypso," the Refreshments, self-publishing and wondering if kids today look back fondly at my generation's music the way I looked back at the sixties generation's. Give it a listen. My interview starts at 30:10. The Nervous Breakdown Self-Interview I did last week was much easier. This is a series I've been reading for years, so I already had a plan of attack. (B.S. as much as possible!) Enjoy it here. Also last week, TNB published a new Badge excerpt. This is more or less me trying to fictionalize that moment when you realize your band is getting big. Read it here. Badge for Sale at Broadway Books!!! Anyone else out there prefer to buy books at an actual bookstore? I'm one of those. I like to take trips to a store, browse the aisles, pick out titles, and take my time doing it. Every purchase comes not just with bound pages but an genuine in-time experience with people, sights, smells: life. Getting it through the mail just doesn't compare. If you're looking to find Badge at a brick-and-mortar store, look no further Broadway Books, hands down the best bookstore in NE Portland. Broadway is one of those places in the world that are getting rarer: a genuine small business enterprise that counts on actual sales of books to stay afloat. Walk into the store and you'll immediately be greeted, asked if you need help, and if you don't, you'll be left alone to make your buying decision at your pace. The ladies up front always seem genuinely happy to assist, find you what you want, order it for you if they don't have it, or just chat. This place is one of the most distinctly Portland experiences around. I once ran into Cheryl Strayed there! During the whole Oprah thing! So, go to Broadway Books and buy Badge, or if not Badge, something else. It's your life. Badge Now On Sale Everywhere! 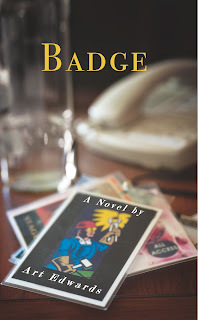 You can now buy Badge everywhere fine books are sold. You can buy Badge at my website. You can buy Badge at Powell's. You can buy Badge at Amazon. You can buy Badge for your Kindle. You can buy Badge for your other ebook devices. And there are plenty of other places too. Looks like we made it! Thanks for your help, folks. Also, to launch Badge proper, I'll be reading at Broadway Books with Monica Drake and Mark Russell this Wednesday at 7 PM. Come out and say hello. I'd love to see you.